Cutting the Basic Payments of farmers who burn land illegally is leading to a reduction in forest and gorse fires but isn’t the way forward, Coillte stated. In 2018, Coillte recorded 321 incidents compared to 690 in 2017. Ciaran Nugent of the Forest Service said that cutting Basic Payments in 2017 before Christmas led to a change in behaviour in the farming community’s attitude to burning. “We have satellites which are looking for hotspots. We then get a text from NASA and it says we have a fire in the declared area, we query that fire. Once it is detected, it goes to the Department,” said Mr Nugent. However, Coillte Risk Manager Mick Power said that education rather than penalising farmers is the way forward. “I’ve had discussions with the Department about it, nobody wants to see anybody getting lumbered or stuck, they might not necessarily cause the fire but they would get caught up in the consequences,” he told the Farming Independent at Coillte’s recent fire safety day in Avondale, Co Wicklow. “You take if a farmer decides to light the vegetation and it travels over to this other guy’s lands, he might not even know that it’s burned and next thing he is docked his payments. With the number of private forestry increasing in Ireland, Mr Power warned that any forest fire could potentially destroy someone’s pension. “If you burn a field of forestry or a field of wheat, you can plant it next spring and you’ll have it again next year. “It takes 40 years to grow a crop of trees that can be destroyed in 10 minutes in a fire. We’d like to see people come to realise that and for everyone to play their part. He added that forest owners should all have fire management plans in place to mitigate the risk of fires. “In Coillte, every plantation we have is covered under a fire plan, the access and water sources are mapped and the relevant people’s numbers. Private people need to do the same thing, maybe get some equipment themselves, a fire pump or dig a water tank. All that type of thing is what will have to be looked at,” said Mr Power. Continental Europe-style wildfires could become the new reality in Ireland by 2050, according to Midland Weather Channel meteorologist Cathal Nolan. Mr Nolan explained that even a 0.6°C increase in temperatures by 2050 could lead to perfect conditions in Ireland for dangerous wildfires to occur. Last year, Coillte spent over €4m treating over 90 fires incidents on Coillte-owned land which severely damaged 400 hectares of forestry and 500 hectares of bog. 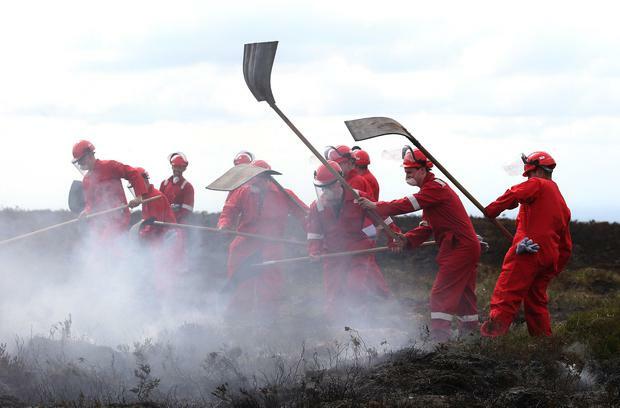 The largest incident occurred in the Slieve Bloom Mountains last July during the drought where 200 people fought the fire over seven days. While Coillte saw a reduction in fires last year, Risk Manager Mick Power said the severity of the incidents and cost to treat them are increasing. Drivers throwing cigarette butts out of cars and people using disposable barbecue fires in forest areas were cited as the main cause of wildfires during June and July last year.